It’s almost Friday and I am ready! 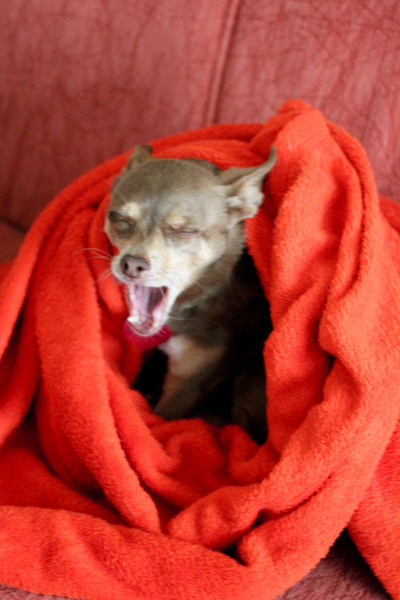 It’s been a busy week, except for the dogs. I can’t blame them, it rained most of today and I’d rather be balled up in a comfy couch blanket too. Instead I was craving a little comfort food for dinner after a busy work day. When I first got into a raw diet over 3 years ago now, I tried for months to be 100% raw. I lost a lot of weight and discovered that a high raw vegan diet consisting of mostly whole foods worked better for me being an athletic type and needing more carbs and protein. And I’ve discovered over the years that works for a lot of high raw vegan chefs too, like Cherie Soria from the Raw Health Expo and Ani Phyo from her Sunset Celebration Demonstration. With a high raw diet, I enjoy a lot of nutritionally dense raw vegan meals – like smoothies for breakfast and salads for lunch. 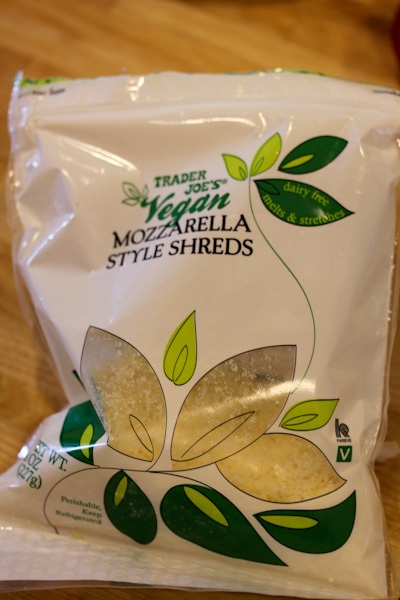 But can enjoy the occasional vegan splurge foods too, like spicy tofu Thai dishes and this wonderful Trader Joe’s vegan mozzarella on hearty quinoa stews. I created a quick tomato quinoa dish to go with the shreds tonight. Place water, tomatoes, miso paste, basil, garlic, oregano, and vinegar into a high speed blender. Blend until smooth and creamy. 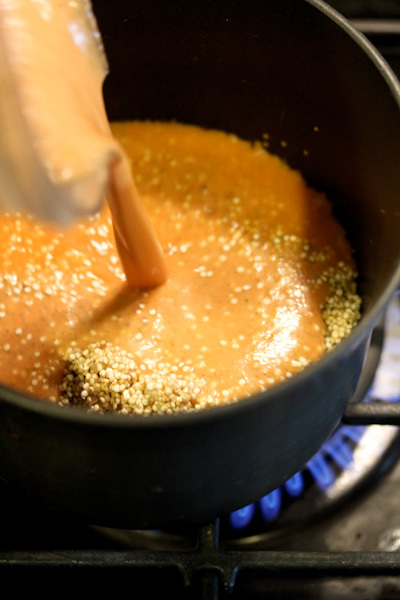 Toast quinoa in a large soup pot until golden. 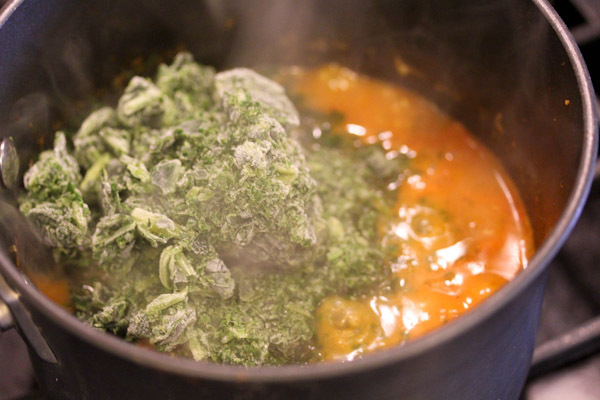 Pour tomato mixture into the pot and add broccoli and spinach. Bring to a boil and reduce heat to simmer. Cover and simmer for about 20 minutes stirring occasionally. Serve and enjoy. Makes 2 large servings or 4 small servings. 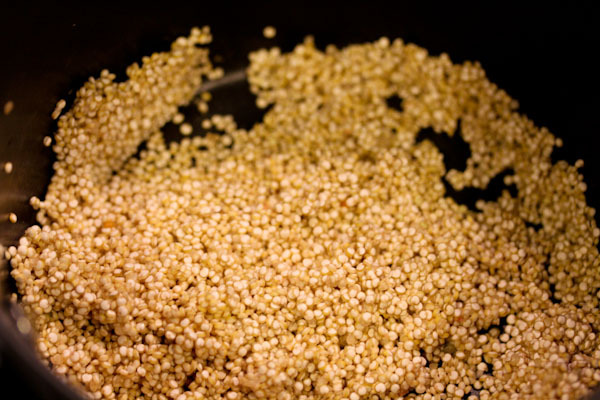 I’ve become a fan of toasting quinoa before cooking, it adds a crunchier, firmer texture to it. 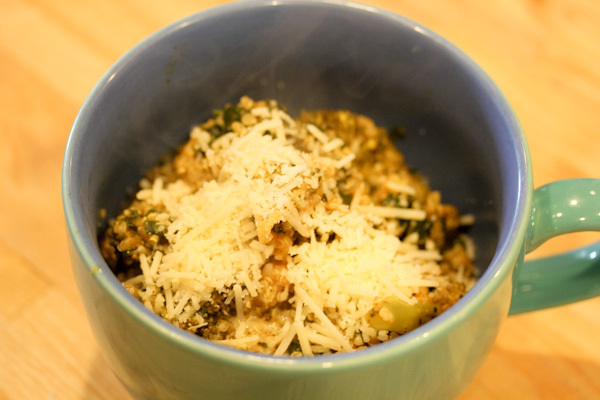 I served myself a heaping bowl and topped with Trader Joe’s gooey vegan mozzarella shreds and they melted into the steaming quinoa mixture nicely. I’m with you, 100% raw was not for me either. For me its more seasonal: during our cold rainy winters I really crave a lot of hot food, once it warms up I like to do more raw (but always include higher protein legumes, tempeh and tofu). DOH! I thought I commented on this one! Sorry! 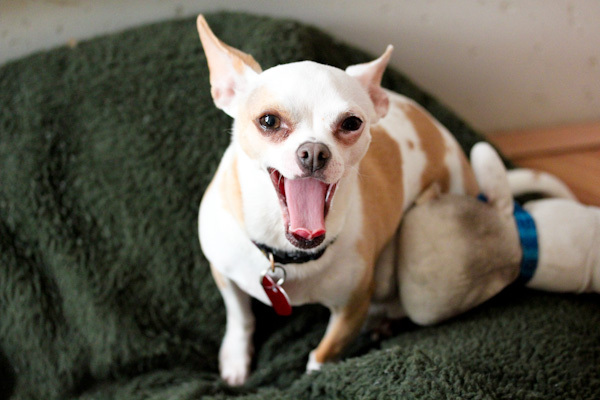 LOVE the yawns of the furkids! That dish looks amazing, too! AND those shred make me wish I had a Trader Joe’s closer! I haven’t been to one in well over a year HOPEFULLY SOON! No worries, I need to do a little comment catching up too! :-) Thanks on the dish and I wish we had more Trader Joe’s in this area too, I only make it about once a month with the drive to get to our closest location.